Kendricks (hamstring) finished the 2018 season with 108 tackles (63 solo), two interceptions, one sack and a forced fumble in 14 games. Analysis: Kendricks suffered the hamstring injury Week 15 against the Dolphins and was sidelined for the final two games of the year. The 26-year-old led the Vikings in combined tackles, though Harrison Smith led the way in the solo category with 67. Kendricks signed a five-year, $50 million extension with the Vikings in April, and he could be relied upon even more heavily in 2019 with Anthony Barr currently set to become a free agent. Kendricks (hamstring) is ruled out for Sunday's game against the Bears. 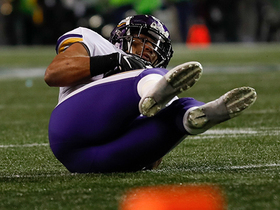 Analysis: Kendricks will miss his second straight game due to a lingering hamstring injury. In the fourth-year linebacker's absence, the Bears could have an easier time running the ball. Expect Eric Wilson to draw the start at middle linebacker as long as Kendricks remains sidelined. Kendricks (hamstring) did not practice Thursday, Chris Tomasson of the St. Paul Pioneer Press reports. Analysis: Kendricks sat out last week's win over the Lions due to a hamstring issue and has yet to return to practice. If Kendricks were to miss Sunday's divisional tilt against the Bears, Kentrell Brothers, Ben Gedeon, Eric Wilson and/or Devante Downs would once again benefit from increased defensive roles. Kendricks (hamstring) has been ruled out for Sunday's game in Detroit, Courtney Cronin of ESPN.com reports. Analysis: Kendricks has played 97.7 percent of Minnesota's defensive snaps this season and easily leads the team with 108 tackles. Kentrell Brothers is next up on the depth chart at middle linebacker, but he won't necessarily replace Kendricks in an every-down role, as the VIkings may also allot more snaps for Ben Gedeon, Eric Wilson and/or Devante Downs. The Detroit backfield may have a slightly easier time with Kendricks unavailable, but this is still a difficult matchup for a struggling offense. Kendricks (hamstring) did not practice Wednesday. Analysis: Kendricks appears to be nursing a knee injury sustained during Sunday's win over the Dolphins. 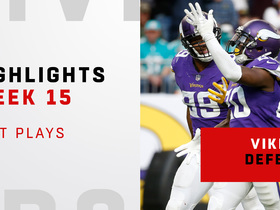 The 26-year-old donned a wrap around his right knee Wednesday, according to Courtney Cronin of ESPN.com, and was the only Viking to not participate in practice. If Kendricks is unable to play against the Lions in Week 16, Devante Downs would benefit from increased defensive snaps. Kendricks had six tackles (three solo) and a sack in Sunday's win over the Dolphins. Analysis: Kendricks also added a pass breakup, but the six tackles represents his lowest total since Week 7 against the Jets. The 26-year-old is nearing a career-high in tackles (108 combined) and has two interceptions this season to double his career total to four. Kendricks had seven tackles (three solo) and an interception in Monday's loss to the Seahawks. Analysis: After going through the first 11 games without an interception, Kendricks now has an interception in two consecutive games. The 26-year-old is poised to set career high as he has 102 tackles (60 solo) through 13 games, after posting 113 total tackles in 2017. Kendricks (ribs) is active for tonight's game against the Seahawks. Analysis: Though he was always expected to play, Kendricks was listed as questionable heading into Monday's matchup after injuring his ribs last week. His availability means he didn't suffer a setback, and he will assume his regular role as Minnesota's starting middle linebacker. Kendricks (ribs) is listed as questionable for Monday's contest against the Seahawks. Analysis: The prevailing sentiment seems to be that Kendricks will indeed play, but fantasy owners may want to be cautious given we likely won't know the 26-year-old's status until closer to Monday night kickoff. Devante Downs and Ben Gedeon would likely step in at middle linebacker on the off chance Kendricks misses any time. Kendricks (ribs) did not practice Friday, Ben Goessling of the Star Tribune reports. Analysis: Kendricks has yet to participate in practice this week despite optimism that he'll be ready to play Monday at Seattle. The 26-year-old's Week 14 availability will likely be contingent on the extent of his participation in Saturday's practice session. 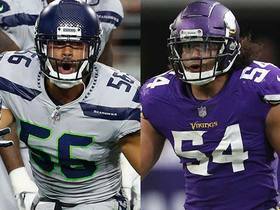 Kendricks (ribs) is expected to play Monday against the Seahawks, Chris Tomasson of the St. Paul Pioneer Press reports. Analysis: Kendricks was a non-participant at practice Thursday but is apparently still on track to play Monday at Seattle. Friday and Saturday's practice sessions should provide additional clarification, and unless the 26-year-old is unable to retake the practice field, his positive outlook seems unlikely to change. Kendricks recorded 16 tackles (eight solo), an interception and a pass defensed in Sunday's loss to the Patriots. Analysis: Kendricks recorded a career-high in tackles and secured his first interception of the season Sunday. He is now on pace for 124 tackles, which would mark a new career high. Kendricks logged 12 tackles (all solo) during Sunday's 25-20 loss to the Bears. 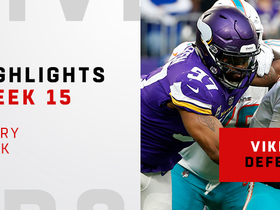 Analysis: Kendricks recorded his highest single-game tackle total of the season during Sunday's loss, and he especially excelled in run-blocking situations. The linebacker more than made up for his occasional errors in pass coverage, and he'll continue to see usage as a three-down piece of Minnesota's defense. Kendricks will look to log another impressive performance against the Packers in Week 12. Kendricks had four tackles (three solo) and a pass defensed in Sunday's win over the 49ers. Analysis: Kendricks struggled a bit in pass coverage, giving up five receptions on eight targets, according to Pro Football Focus. Still, he should improve, and he's a good source of tackles in Minnesota's defense since he stays on the field in nickel packages. Kendricks is signing a five-year, $50 million extension that includes $25 million guaranteed, Ian Rapoport of NFL Network reports. Kendricks recorded a team-high 113 tackles (67 solo) to go along with six passes defensed, one sack, one interception and one touchdown across 16 games in 2017. Analysis: Kendricks couldn't be contained in 2017, logging four separate double-digit-tackle performances in the regular season. The 25-year-old has one more year left on his rookie contract before becoming an unrestricted free agent, meaning a big payday is on the way in the not-too-distant future. For now, expect Kendricks to head into 2018 as one of the Vikings' defensive leaders, as he'll look to log his third-straight season with 100-plus tackles. Kendricks had five total tackles, a tackle for a loss and returned an interception 31 yards for a touchdown in Sunday's win over the Bengals. Analysis: Kendricks has been on a hot streak the past three games with 24 tackles, two passes defensed and an interception. He piles up tackles (7.2 per game) but isn't involved in blitz packages too often as he has just one sack this season. Kendricks had nine tackles (one solo) against the Panthers on Sunday. Analysis: Kendricks logged all 64 defensive tackles. Although it's troubling that only one of his tackles was solo, Kendricks has plenty of worthy showings to backup his IDP ability. The Bengals are on the Week 15 agenda, and they make their living on the ground and short passes, so Kendricks has high fantasy potential. Kendricks had ten total tackles (eight solo) and a pass defensed in Sunday's 14-9 win at Atlanta. Analysis: Kendricks missed practice Wednesday and was limited Thursday and Friday with a hip injury, but he was at full speed on Sunday. Kendricks (hip) is active for Sunday's game at Atlanta, the St. Paul Pioneer Press reports. Analysis: Kendricks missed practice Wednesday and was limited Thursday and Friday, but head coach Mike Zimmer had said he expected him to play. Vikings coach Mike Zimmer expects Kendricks (hip), who is listed as questionable, to play in Sunday's game against the Falcons, Andrew Krammer of the Minneapolis Star Tribune reports. Analysis: Kendricks missed practice Wednesday and was limited Thursday and Friday, but his failure to log a full session apparently doesn't concern Zimmer too much. The 2015 second-round pick easily leads Minnesota with 77 tackles, but he only has one sack and hasn't had a hand in any turnovers. 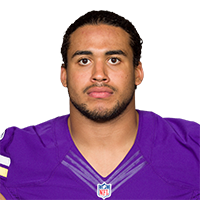 Kendricks (hip) is listed as questionable for Sunday's game against the Falcons, Chris Corso of the Vikings' official site reports. Analysis: Kendricks has played all 11 games this season, posting 77 tackles (47 solo) and one sack. If he can't play Sunday, expect Kentrell Brothers to be tasked with stopping running backs Devonta Freeman and Tevin Coleman. Kendricks led the Vikings in tackles with 10 (five solo) in its victory over the Redskins on Sunday. Analysis: Kendricks has now logged double-digit tackles in three of the previous four games. He was one of three Vikings defenders to play all 75 snaps, and figures to continue being heavily involved going forward. NFL Network's MJ Acosta reports the latest information on the Minnesota Vikings' "Monday Night Football" matchup with the Seattle Seahawks. 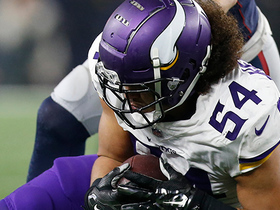 Minnesota Vikings linebacker Eric Kendricks picks off New England Patriots quarterback Tom Brady. Chicago Bears wide receiver Anthony Miller somehow holds on to a big-time catch. 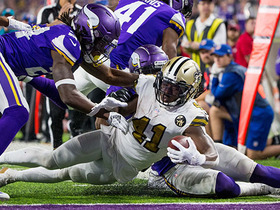 New Orleans running back Alvin Kamara dives for the end zone on a 17-yard catch and run, but comes up just short. All three New Orleans Saints quarterbacks line up on second-and-goal. 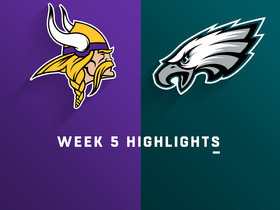 Watch Week 5 highlights between the Minnesota Vikings vs. Philadelphia Eagles in a rematch of the 2017 NFC Championship.